If you everyday work long hours on a computer, I seriously recommend you to check out Rafa's Vocabulary Ticker - an alternative language learning programme, considered by many to be one of the best methods to learn Portuguese. It might not be suitable for everyone, but it's indeed a great way to learn Portuguese. If you want to discover it by yourself right now, please click on the box on the right-hand-side column now, otherwise please read on. As someone who wants to learn Portuguese, don't you sometimes feel that you don't have enough spare time to dedicate to your learning? If so, don't worry. We all know the feeling. 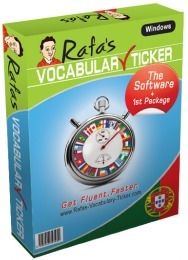 Rafa’s Vocabulary Ticker has been designed to be that unique language-learning tool for busy students with demanding lifestyles, who spend long hours working at their computer and who want to learn and communicate in Portuguese having no time available to spare on their learning. Rafa's Vocabulary Ticker is a "CALL" - Computer-Assisted Language Learning tool - based on a piece of software, which allows you to be in contact with those useful Portuguese words and expressions all day long, and with that I mean, as long as you have your computer switched on. With Rafa's Vocabulary Ticker, you will be learning Portuguese with your concious and subconscious mind, almost as if you have immersed yourself in the language. A way that can make you speak Portuguese easily,without frustration, without demanding time from you to learn, and allowing you to have fun and satisfaction with your learning. Come on! Learning must be fun, don't you agree?. Only when we have fun we learn and retain things in our memory for ever. But Rafa's Vocabulary Ticker is not only a way for you to learn a language having fun. It teaches you the vocabulary, what you should say and hear in Portuguese by categories of situations. OK... What can Rafa’s Vocabulary Ticker teach me? This is a programme to learn Portuguese with the facility to be loaded with new categories of words as you progress with your learning. It's a pay-as-you-learn system where you choose what to learn next as you successfully progress. This language tool will also give you the right pronunciation letting you listen to the sounds of the words and phrases, which you can repeat as many times as you want to get them stick. When you are confident enough about what the words sound like, and how the words are pronounced and spelt, you can switch the sound off and keep on recalling the words just by looking at them. But... Can you imagine reaching a level when you don't need to listen to the words any more to be able to remember and recognize them? Yeah baby! This is what this programme to learn Portuguese is all about. If you do it all, look at, hear and pronounce the words 3 or 4 times when you first see them, you can pretty much recall them later with much more ease and confidence. Check out by yourself what you can do with this Rafa's Vocabulary Ticker programme here now. ... select categories of words and expressions you want to learn from the range of categories available (e.g. Most Common Words, Meeting People, Numbers Time & Location, Clothing and Accessories, etc.). ... select the words you want to learn from each category. ... listen to and repeat the words and expressions as many times as you want to. ... select the speed you want learn them. ... select if you want to see the words passing by on your computer screen, or just be reminded of a new word, as often as you want it to. ...add, record and learn your own words and expressions as you please. ... build your vocabulary by categories (Eating & Drinking Out, My Family & I, House & Furniture, Verb conjugation, etc.). ... keep on building your vocabulary upon what you already know by being reminded of all the words and expressions you have learned before, as you learn new ones. ...learn either from English into Portuguese or Portuguese into English - Only Portuguese words will be played. ... choose where best this application fits in your computer screen (at the top or at the bottom or even hidden). ...choose the correct application whether you are using Windows or Mac, or even Linux. ...choose the font, size and colour you feel more comfortable and more receptive for learning. ...choose the background colour of the platform, where the words will be running. ...choose random selection to test you if you can really recall the words and expressions you have already learned. ...use your full brain capacity for learning – your conscious and subconscious mind. ...feel satisfaction with your learning. ...have great fun while you are learning Portuguese, as this method can be turned into a great game that you can play with your friends and members of your family and learn Portuguese together. You’ll also be able to realise what it sounds like when you need to run words together in a certain expression, which you can repeat over and over again. This way you will easily learn the sounds of the words without having to pay much attention to the exceptions. You will learn by practising and by dint of repetition all day long. One package of 174 words and expressions that comes with this software by default, when you download it to your computer. This is for you to get used to the system and start learning straight away. Other packages that you can choose and download directly from its website straight in to your Rafa’s Vocabulary Ticker. Get emails about the new packages, explanations about the language and other materials I’ll keep on producing, once you register to my free newsletter here. So you’ll be always the first to know about the hottest releases. Are you still thinking why you should use this method to learn Portuguese? 1. Practical: The simplicity of this software format means that you can use it on either your desktop or laptop computers everywhere and whenever you want. You can also use it while you are cooking your dinner, working out in your room, or doing simple domestic activities by simply turning on the speakers on your computer. It's very versatile, and that's one of the reasons it's considered by its users to be the best method to learn Portuguese. 2. Quick: You can download your copy of the Rafa’s Vocabulary Ticker within a few minutes (after registering and purchasing it) and get started right away. 3. Effective: You’ll be learning Portuguese without realising (unlike any other conventional method for learning Portuguese. 4. Safe: I use a world-class secure register, order and delivery system. Payment for new packages will be done through the secure system PayPal (which you can use to pay with any credit or debit cart too). All you have to do is keep on purchasing packages at a very reasonable price as you progress with your learning. Think about the price you have to pay for many things you don’t really need but you keep on buying, which after a week or two you throw away or never use again. Or think about the price you would be paying for classes that very often you are not able to attend and you end up loosing the plot. By learning Portuguese with Rafa's Vocabulary Ticker you are investing in yourself and you’ll retain this knowledge forever. 6. No-risk: You will get a 100% money-back guarantee on the packages of words and expressions you purchase. I want you to be satisfied with your purchase, and above all, with your learning progress. Let me know if you're not, within two weeks, and I'll refund your order straight away. Get started and click on the image below now. So, If you haven't done it yet, get this method for learning Portuguese by clicking here now. Go Back From Best Method For Learning Portuguese To Home Page. Rafa's Vocabulary Ticker Will Help You Get Fluent Faster. You are a genius. This is perfect. Your packs teach exactly what is essential to get along to start speaking the language. I have quite a number of other different courses and they disappoint me. I am so fed up with all this tourist phrases. ”Onde fica o banco? Onde posso alugar um carro?” One of the courses I bought said it was a complete conversational course. It was numbers, days, dates, greetings, some useful words and some verbs and the course ended with some sentences in the present. That was all of it. But in the packs you present here, there are just the glossary I need to glue together ordinary sentences, which I need to talk to friends and the people I meet in Portugal. Words and sentences like, That's it!, at least, by the way, even better, neither…nor, besides, etc.. This is just what I was missing to make daily-life sentences. I also like very much the explanations you put in, like ”for things”, as indicating the way” etc.. I also learn some new English glossary here. "Rafa's Vocabulary Ticker is a great tool, and in my opinion, the best method for learning Portuguese, if you want to learn Portuguese fast. The useful vocabulary bar allows you to glance over the words while you're working on your computer, as it sits nicely on the background on your screen. The sound function means that the words are pronounced aloud for you, which is great to learn how to pronounce them too. You can also choose to hide the bar and still have the words read aloud - this is extremely useful to get your ear used to the sound of the language if you're looking at travelling to Portugal or Brazil, for instance! What I like the most however (and that's why I say this is the best method for learning Portuguese) is that from Rafa's Vocabulary Ticker you can select the words you want to learn. You can purchase separate word packages, so that you can learn the specific vocabulary you need, whether it's day-to-day terms or travel-related words... You can also type in any other words that you want to remember, record them yourself, and the ticker will display them and read them aloud for you. All in all. This is definitely the best method for learning Portuguese, and I highly recommend Rafa's Vocabulary Ticker if you want to learn Portuguese in a fast, effective and tailor-made way. If you get Rafa's Vocabulary Ticker today you'll start speaking Portuguese in minutes!" "This App is really amazing! Completely customizable and uses repetition to make words and phrases stick. Definitely the best method for learning Portuguese! Muito Obrigado Rafa!!" Tony - U.S.A.